This project started off as an effort to implement a thermometer that could record the high and low temperatures in my apartment using three sensors. My intent was to mount one sensor on the ceiling, one at eye level and one on the floor. It was painfully boring, so I decided to add blinking lights. This quickly became the focus of the project. The blinking lights are the real highlight of this for the beginner hardware tinkerer. 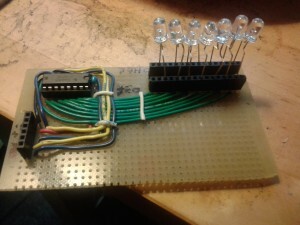 There are eight LEDs driven by only three digital IO pins on the Arduino. The thermometers are either LM35s or TMP36s. For educational purposes they are entirely optional but the code supports using either one of them, The blinking lights use a 74HC238 to drive them one at a time. The Arduino is plenty fast enough to make them all appear lit at once. The README is here. A tar with the Arduino source code and a schematic of the board is here. 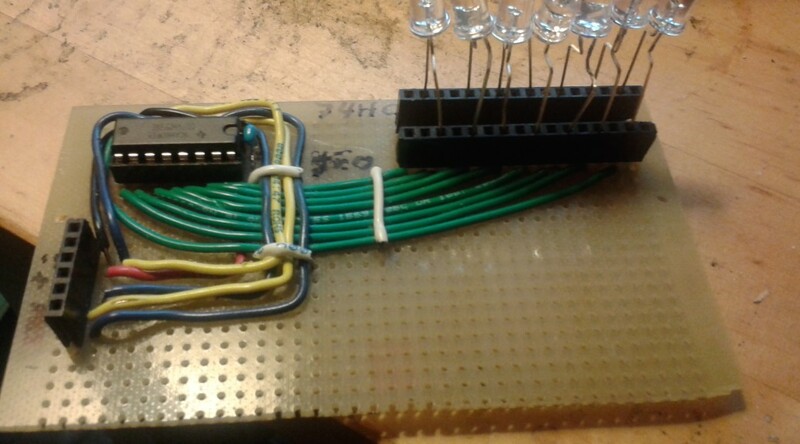 (BTW: If I had it to do over again, I would have used a pair of 74HC595 shift registers so I could have had 16 LEDs, but I didn’t know about shift registers then. By cascading 8 bit shift registers I could have had a nearly arbitrary number of LEDs with the same three IO lines on the Arduino.